Disciple: I do not sufficiently comprehend your explanation. I need a simpler explanation, more in keeping with my understanding. Elder: The means whereby the fallen angel brought ruin upon the human race was falsehood (Gen. 3:13). 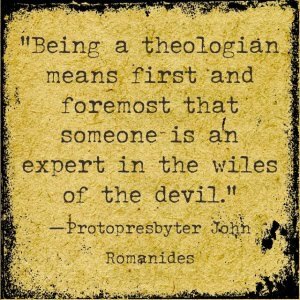 For this reason did the Lord call the devil “a liar, and the father of [lies]... a murderer from the beginning” (Jn. 8:44). We see that the Lord closely associated the notion of falsehood with the notion of murder; for the latter is the inevitable consequence of the former. The words “from the beginning” indicate that from the very start the devil has used falsehood as a weapon in murdering men, for the ruination of men. The beginning of evil is in the false thought. The source of self-delusion and demonic deception is the false thought. By means of falsehood, the devil infected mankind at its very root, our first parents, with eternal death. For our first parents were deceived, i.e., they acknowledged falsehood as the truth, and having accepted falsehood in the guise of truth, they wounded themselves incurably with mortal sin, as is attested by our ancestor Eve, when she said: “The serpent deceived me, and I ate” (Gen. 3:13). Thenceforth, our nature, infected with the poison of evil, has, voluntarily or involuntarily, inclined toward evil which, to our perverted will, distorted reason, and debauched heart, presents itself as good. I say voluntarily because there still remains within us a remnant of the freedom to choose between good and evil. And I say involuntarily because that remnant of freedom does not function as complete freedom, but rather under the unavoidable influence of the wound of sin. Thus is every human born and cannot be otherwise; and for this reason we all, without exception, find ourselves in a state of self-delusion and demonic deception. From this view of man’s state with regard to good and evil, the state which is necessarily characteristic of each human being, we arrive at the following definition of spiritual deception which explains it satisfactorily: spiritual deception is man’s assimilation of a falsehood which he accepts as truth. Spiritual deception first acts upon one’s way of thinking; on being accepted and having perverted one’s thought processes, it is forthwith communicated to the heart whose sensibilities it distorts; having mastered the essence of man’s being, it seeps into every one of his activities and poisons the very body which the Creator has indissolubly joined to the soul. The state of spiritual deception is the state of perdition or eternal death. From the time of man’s fall, the devil has had free access to him. The devil is entitled to this access, for, through obedience to him man has voluntarily submitted to his authority and rejected obedience to God. However, God has redeemed man. To the redeemed man He has given the freedom to submit either to God or to the devil; and that this freedom may manifest itself without any compulsion, the devil has been permitted access to man. It is quite natural that the devil makes every effort to keep man in his former subjection to him, or yet to enslave him even more thoroughly. To achieve this, he implements his primordial and customary weapon --- falsehood. He strives to deceive and delude us, counting on our state of self-delusion. He stimulates our passions, our sick inclinations. He invests their pernicious demands with an attractive appearance and strives to entice us to indulge them. However, he that is faithful to the Word of God will not permit himself to do so; he will restrain the passions and thus repulse the enemy’s assaults (see Jas. 4:7); struggling against his own self-deception under the guidance of the Gospel, subduing his passions, and thus gradually destroying the influence of the fallen spirits on himself, he will by stages pass from the state of deception to the realm of truth and freedom (see Jon. 8:32), the fullness of which will be given through the overshadowing of divine grace. He that is not faithful to Christ’s teaching, who follows his own will and knowledge, will submit to the enemy, and will pass from a state of self-deception into a state of demonic deception, will lose the remnant of his freedom, and in the end he will become totally enslaved to the devil. The state of those who are demonically deluded varies, depending upon the passion by which the particular individual is deluded and enslaved, and corresponding to the degree to which he is enslaved by that passion. And all those who have fallen into demonic delusion, i.e., those who, through the development of their own self-delusion, have entered into fellowship with the devil and have been enslaved by him, are temples and instruments of the demons, victims of eternal death, of life in the dungeons of hell. Disciple: Enumerate for me the types of demonic delusion which result from the improper exercise of prayer. Elder: All the forms of demonic delusion to which the athlete of prayer is subject arise from the fact that repentance has not been set as the foundation of prayer. St. Gregory the Sinaite says: “Should anyone fancy to attain unto exalted states of prayer with a self-confidence based on a conception of one’s own worth, and has acquired not true zeal, but that of the devil, him will the devil easily enmesh in his snares as his slave.” Everyone who hastens to the wedding banquet of the Son of God, not in the clean and radiant garments wrought by repentance, but rather in the old rags of sinfulness and self-delusion, will be cast into the outermost darkness, into demonic deception. “I counsel thee,” the Savior says to one whom He calls to the mystical priesthood, “to buy of Me gold tried in the fire, that thou mayest be rich; and white raiment, that thou mayest be clothed, and that the shame of thy nakedness not appear; and to anoint thine eyes [of sense and the eyes of thy mind] with [the] salve [of tears], that thou mayest see. As many as I love, I rebuke and chasten; be zealous, therefore, and repent” (Rev. 3:18-19). Repentance and everything that comprises it, such as: contrition or travail of spirit, lamentation of heart, tears, self-reproach, remembrance and foreboding of death, the judgment of God and the everlasting torments, the awareness of God’s presence, fear of God --- are all gifts of God, gifts of great worth, gifts which are basic and represent our assurance of loftier and eternal gifts. The latter you can never receive unless you have received the former. “However great the life we may lead,” says St. John of the Ladder, “we may count it stale and spurious, if we have not acquired a contrite heart” (Ladder of Divine Ascent, Step VII, 64). Repentance, contrition of spirit, and lamentation are signs which attest to the correctness of our feat of prayer. Their absence, on the other hand, is a sign of inclination towards false direction, self-delusion, deception and barrenness. One or the other, delusion or sterility, is the inevitable consequence of the incorrect exercise of prayer, and the incorrect exercise of prayer is inextricably bound up with self-deception. The most dangerous and most incorrect method of prayer is when he who is praying fabricates, on the strength of his imagination, dreams or pictures, borrowing them ostensibly from the Sacred Scriptures, but in actuality from his own sinfulness and self-delusion. By means of those pictures he lures himself into self-esteem, vainglory, conceit and pride. It is apparent that all that is fabricated by the imagination of our fallen nature which has been perverted by the fall of nature does not exist in reality. It is nothing else but the fantasy and falsehood so characteristic and beloved of Satan, the fallen angel. With the first step that he takes on the path of prayer, the fantast departs from the realm of truth and enters the realm of falsehood, the realm of Satan, and willingly submits to Satan’s influence. St. Symeon the New Theologian describes the prayer of the fantast and its fruits thus: “He raises his arms, eyes, and mind toward heaven; and he fancies in his mind divine meetings, heavenly blessings, the ranks of the holy angels, the dwelling-places of the saints... in short, everything that he has heard of in the Divine Scriptures he gathers together in his imagination. He contemplates all that during his prayers and gazes heavenward, and spurring his soul on to divine desire and love, and sometimes he even sheds tears and weeps. His heart thus grows gradually bolder, without his even being conscious of it. Not only that, but he also assumes that what is happening to him is the fruit of divine grace, conferred on him by the Lord for his consolation, and he entreats the Lord to vouchsafe him ever to abide in such spiritual activity. That is a sign of delusion. This sort of person cannot but fall subject to delirium and insanity, even though he observes perfect prayerful solitude. And even should he manage to avoid such a spiritual disaster, he nevertheless will never acquire a spiritual mind, virtue, or dispassion. In this manner those who have beheld light and radiance with their physical eyes, who savor sweet fragrances with their sense of smell, and hear voices with their ears, have been deceived. Some of them have become possessed by evil spirits and have wandered about, deranged, from place to place; others have accepted a demon that transformed himself into an angel of light, and were deceived and remained uncorrected even until the end of their lives, refusing the counsel of any of the brethren; still others, instructed by the devil, committed suicide; some cast themselves into an abyss, others hanged themselves. Who can enumerate the manifold deceptions of the devil which he uses to delude and which are inscrutable? Any knowledgeable man can learn from what we have said as to the damage which ensues from this type of prayer. Such misfortunes befall mostly hermits who lead a solitary life, but it is possible that some of those who pray incorrectly will not fall subject to one of the calamities described above because they live in community with the brethren; yet such a person spends his whole life in vain. As an example, we may take the life of St. Amphilochius. He entered monasticism in his youth, and in his mature years and old age he was deemed worthy to lead the life of a hermit in the desert. Confining himself to a cave, he trained himself in stillness and was greatly successful therein. After forty years of solitary living, an angel appeared to him one night and said: “Amphilochius! Go thou to the city and shepherd the spiritual sheep!” Amphilochius, however, remained unperturbed and paid no heed to the angel’s command. The following night, the angel again appeared and repeated his command, adding that it was sent by God. And once again Amphilochius did not submit to the angel, fearing lest he be deluded and mindful of the words of the Apostle, that Satan can appear even as an angel of light (II Cor. 11:14). But the angel returned once more on the third night, glorifying God in order thus to convince Amphilochius, for, as is generally known, the outcast spirits cannot bear this. Then the angel took the old man by the hand, led him out of his cell, and brought him to the church which stood nearby. The doors of the church opened of themselves. The church was illuminated with a heavenly light and a multitude of holy men in white robes were visible therein, their faces shining with a sun-like radiance. They consecrated Amphilochius as bishop of the city of Iconium. 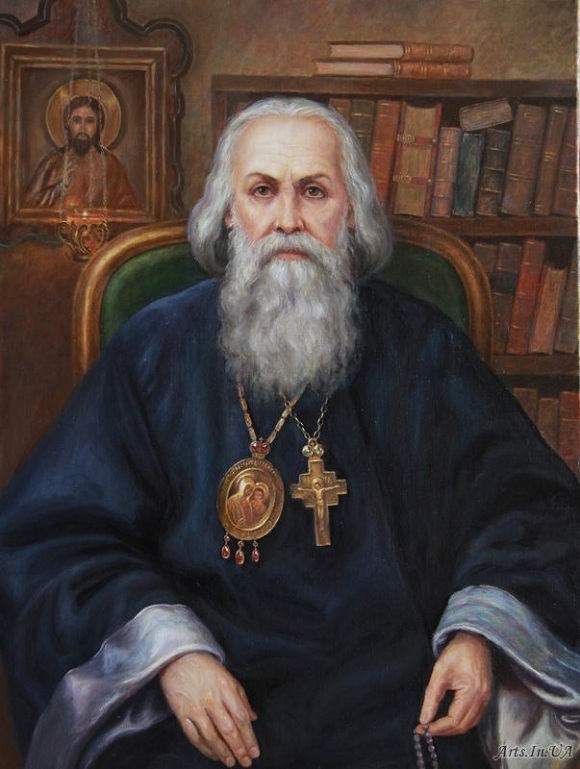 In contrast to this procedure, the venerable Isaac and Nicetas of the Kiev-Caves Lavra, while yet new and inexperienced in the solitary life, gullibly believed a vision which appeared to them and therefore fell into the most dreadful misfortune. To the former, a multitude of demons appeared in light; one of them assumed the guise of Christ, and the rest that of holy angels. The latter was first deceived by a demon by means of a sweet fragrance and voice, afterwards appearing to him openly in the guise of an angel. Monks who are experienced in the monastic life, truly holy monks, fear delusion far more, show a far greater distrust of themselves, than do beginners who are seized with fervent zeal for the ascetic struggle. The venerable Gregory of Sinai, the Hesychast, with heartfelt love warns us to guard ourselves against delusion. “I desire,” writes the Saint in a book written chiefly for those who pray in solitude, “that you have a clearly-defined understanding of delusion. I desire this with the goal in mind that you may be able to preserve yourself from delusion, that, in a struggle which has not been illumined by the necessary knowledge, you not inflict great damage upon yourself and destroy your soul. For man’s free will readily inclines to fellowship with our adversaries, particularly the will of those who are inexperienced and new to the struggle, for they are still in the power of the demons.” How true! Our free will does incline toward deception because every delusion flatters our self-esteem, our vainglory, our pride. “The demons are close by and surround beginners and the arbitrary, spreading in their path the snares of evil thoughts and pernicious fantasies, digging for them abysses into which to plunge. The city of the novices,” i.e., the entire being of each of them individually, “is still under the suzerainty of the barbarians... Wherefore do not hasten to deliver yourself over to that which appears to you, but remain serious, holding on to what is good with much circumspection, and rejecting what is evil... Know also that the effects of grace are always clear; the demon is incapable of producing them: he cannot give meekness or gentleness or humility or hatred of the world, and he does not restrain the passions of voluptuousness, as grace does. These are the effects of the devil: conceit, haughtiness, fear --- in a word, all forms of malice. Therefore, by its activity will you be able to discern the light which shines in your soul, whether it be from God or from Satan.” We ought to know, of course, that such circumspection is the property of advanced monks, never of beginners. The venerable Gregory of Sinai, it is true, is conversing with a beginner, but, as is evident from the book, a beginner in the life of prayerful stillness who was, according to the years he had spent in monasticism and from his age, already an elder. Taken from Orthodox Life, Volume 30, No. 4, July – August 1980, published by Holy Trinity Monastery, Jordanville, New York. Translated by S. Karganovic from the Serbian edition of the writings of Bishop Ignatius (Brianchaninov). The text above has been carefully compared with the Russian original in The Works of Bishop Ignatius (Brianchaninov), Vol. I (Ascetic Experiences), pp. 129-135. The above is but a segment of a longer article on spiritual deception.